Hosted by Jon Kulp on 2013-07-02 is flagged as Clean and is released under a CC-BY-SA license. 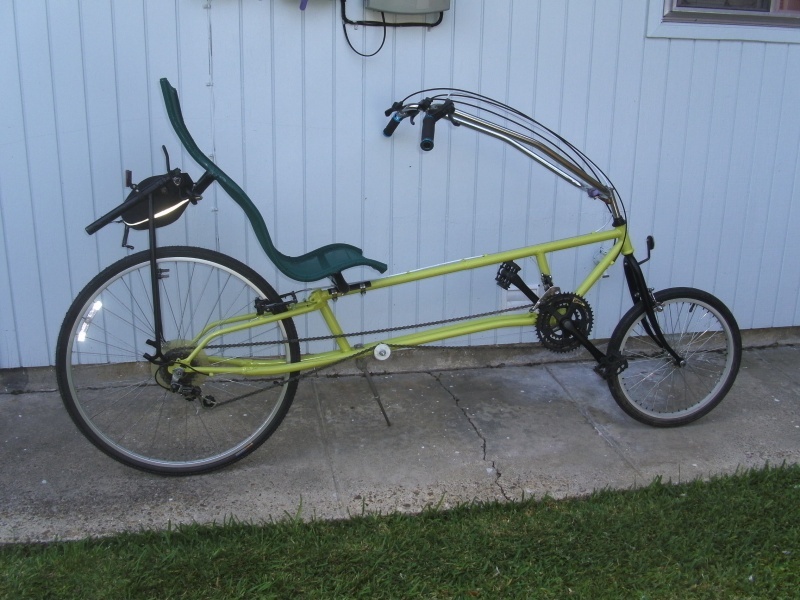 In this episode I discuss my experience building a Recumbent Bicycle from donor bikes. A couple of things I forgot to mention while recording the podcast. First of all I had to use tandem bicycle cables for the brakes and the rear derailleur because they had to be very long. I also forgot to talk about the time when I was in a panic that the rear triangle was a bit out of alignment with the front, such that it would make the bike turn a little bit to the left by default. I called Andrew Carson and asked him if there was anything I could do to fix it and his solution was just awesome. What he told me to do was to put a spare hub in the rear triangle to keep the seat- and chain stays from collapsing together, lay the frame on the ground with the front end propped up on a step or something, and then just stand on it, jumping up and down slightly on it if necessary until I could feel it bend back a little bit. This actually worked! It straightened the frame right out. :) Finally, the total cost for this project was under $300. The most expensive single part of it by far was the powder coat, which cost $120. Here are links to resources mentioned in the podcast or simply of general interest.